-some typos and such, my apologies, the final products will be flawless. take the time to answer, discuss these questions, create your own. send them back to me and I will publish and promote across our network. This is a pet project of mine, i am very interested in the minds that create, I hope to complete 2 such articles per week as time allows. There are no deadlines and no right answers. If the header, artiist, drew your attention then you are who I am looking for. “Many intelligent people have accepted the false idea that accuracy in representing visual facts is a sign of progress in art. Such imitation of superficial effects has nothing to do with art, which is and always has been the making of mental concepts. Even the scientist is interested in effects only as a phenomena from which to deduce order in life.” … “‘Looks like’ is not the test of a good painting. It indicates merely visual similarity and shows that the artist has not put his brain to work. Feel free to skip and dodge any questions that bore you. Have you always been an artist, as a boy/girl were you drawn to the act of creation? What have been some positive influences in your development as an artist? Do you have a favorite artist, or school of art? Did you receive a formal education in arts, if not how did you learn to use the materials and mediums that you choose? What is your opinion of arts education? Is an artist born or made – or both? What do you feel most influences your current attitude/style in painting/media. i.e. Do you find reference and inspiration from pop culture, philosophy, the human body, wonderful vistas etc. has your passion for art detracted from your success in other areas (i.e. If someone asks you “what do you do”, how do you respond? what are you currently working on, how is it different from past works. do you feel you evolve as an artist? How important is the company of other artists and creative individuals to your well being and creative output. Do you dislike/disdain the works of other artists? Do you display your works? If so, where have you displayed. Do you have any words of wisdom for artists trying to “break out” and begin to learn the business of art. Do you find that the practical aspects of selling,promoting and marketing yourself as an artist detracts from your creative process. What is the goal of art! what are your goals as an artist. We are more than what we make, what other activities do you enjoy. In 20 years, what are your aspirations, what would you like to achieve. have you done any commercial, public or commissioned work. if so, how do you feel about your vision being directed by third parties. Do you have any opportunities to offer other artists (collaborations, gallery space, friendship etc. How has the internet changed your promotional activities. Do you have any favorite resources you would like to share? Where can one view your work online? tell the truth, do artists make better lovers? I wouldnt expect every question to speak to you or be relevant to you, feel free to add anything you think may be missing. I will be using a similar arrangement of questions for all the interviews, most likely laying the interview out in Q-A form with some minor poetic license. Before actual publication I will send the final copy to you, as i would not want you to feel misrepresented. Include any personal portfolio links you would like to accompany the interview and tell me which works I can post directly with the piece. At your request: I can include a link or note that contains your resume/cv or project history -any bio info that you would like presented can be included. I can watermark or limit res on any included artworks at your request. By having your name and related keywords at so many locations your placement on Search engines will jump. Although, your requested pages will be linked, please also include whatevr contact info you feel comfortable sharing, keep in mind that you DO not want your most personal email address to be posted as spam bots/harvesters will collect it and it to their lists. This will be an ongoing project and I will be posting this message continuously as to attract attention, sorry in advance. 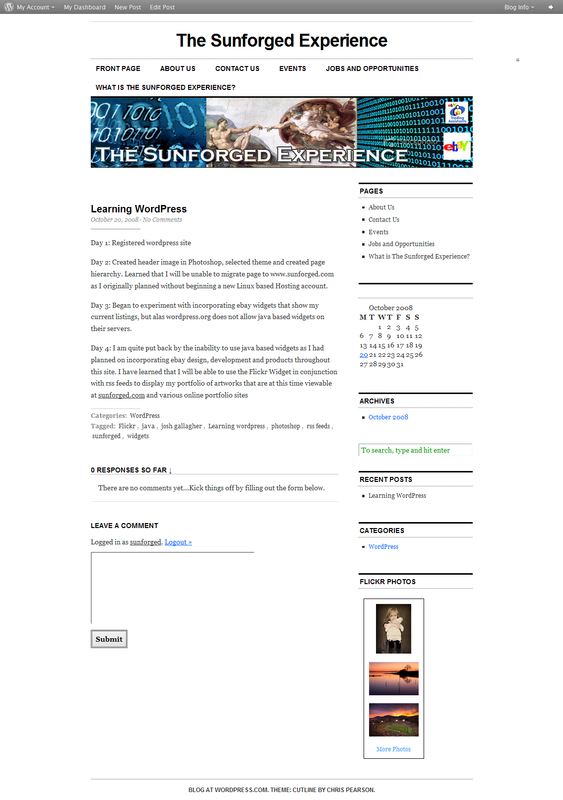 Day 2: Created header image in Photoshop, selected theme and created page hierarchy. 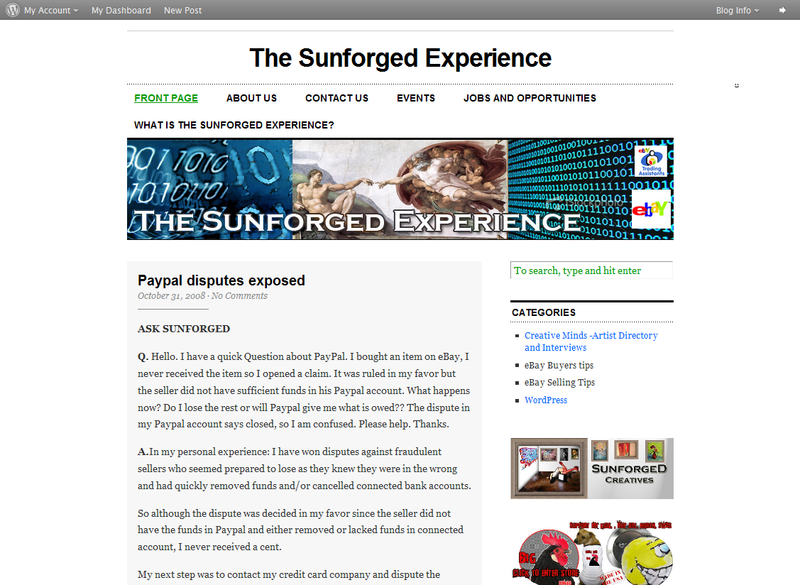 Learned that I will be unable to migrate page to http://www.sunforged.com as I originally planned without beginning a new Linux based Hosting account. Day 3: Began to experiment with incorporating ebay widgets that show my current listings, but alas wordpress.org does not allow java based widgets on their servers. Day 10: I have put off design and function issues in order to focus on a massive amount of content that I have backlogged. I have found some workarounds relating to using built in rss widgets and text boxes to include content and links that I previously considered impossible to include due to free hosting constraints. The page has changed dramatically though and I will be including a new screenshot.